I have been obsessing over these lace up tops forever, and finally decided to get one seeing as they are so reasonable from Missguided. This top says a lot for me, so I felt that I needed to keep everything quite minimal, opting for black jeans and some flat knee high boots. 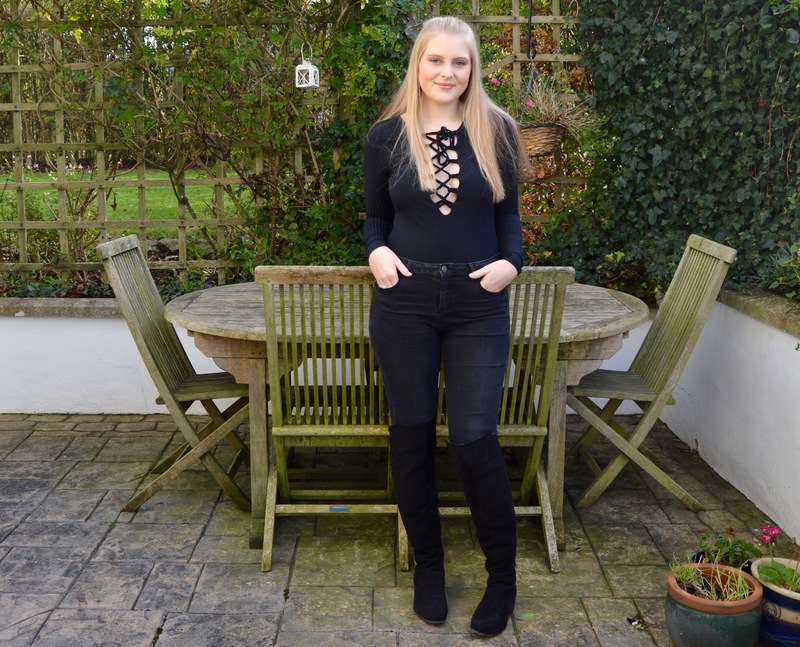 I have had these knee high boots for about a month now, and cannot believe that it has taken me until now to tell you guys about them! They are the most comfortable pair of boots I have ever worn, and I cannot even begin to describe how warm my legs are as the weather is getting colder! It took me a while to finally buy some, as I had seen so many people wearing them, but I just wasn’t sure if they were going to suit me. I am so glad I did, and they are literally worth every single penny. I have also just realised that today is Black Friday, so my blog post is very accurate for the date! For me, this was so out of my comfort zone, and very different to what I usually post on the blog, however I just thought that I needed to try something a bit different. Ultimately, I will go nowhere if I never leave my comfort zone. To accessorise the outfit, I wore my latest infinity ring from Coconut Lane, and some earring sent to me from Mirina Collections. Marina Collections were responsible for that utterly breathtaking statement necklace that I posted a few weeks ago. If I were brave enough to actually wear this out, I think I would choose a simple black blazer and my black clutch with a gold tassle. Wow I must love black, haha! Don’t forget, if you are interested in purchasing from Coconut Lane or Mirina Collections, you can use my unique discount codes to get 20% off. I have worked with Mirina Collections and Coconut Lane, however all views and opinions are my own.